Bluetooth is a short-range wireless communication technologies, working in 2.4 GHz的 the ISM band, the band Green free band of the genus, use the band the radio resource management departments to apply for license. Bluetooth has adopted a frequency hopping spread spectrum in the way, have good shielding, entered industrial control areas, more and more applications in industrial automation, distributed data acquisition, intelligent transport, electricity, hydraulics, and many other industries, industrial control interface implemented as RS232/RS485/RS422 transparent wireless transmission of signals. 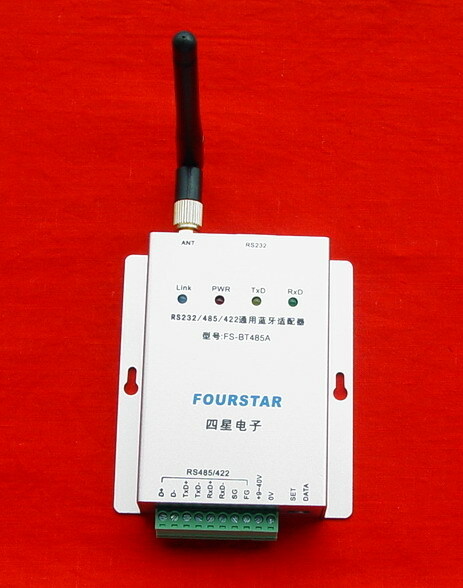 FS-BT485A(FS is a registered trademark of the FourStar electronic FOURSTAR ), Bluetooth serial port adapter is also known as RS232/RS422/RS485 go Bluetooth is a FourStar electronic research's industrial-grade Bluetooth serial port adapter, the implementation of RS232、 RS485、RS422 transparent Bluetooth wireless transfer without alteration original serial communication protocols and software, just simple setting to override the original copper wire cable transmission, this product is by UART data formats for transparent transmit data, apply to all comply with UART The various data formats RS232、 RS485、RS422 interface. Some field bus such as PROFIBUS、 PPI、 MPI、Modbus 、 CC-link 、PC-Link, etc., although its physical communication port to RS485 interface, but they do not comply with UART data format, so do not apply to this product! ● power supply voltage: ~ 9 wide 40VDC voltage power supply, power consumption of about 1W, the product internally DC/DC isolation modules will be external power supply and internal circuit isolation, external power supply can be taken from any device not a total of land issues. Antenna： this product is standard device 2.4 GHz， 3dB antenna, to enhance communication in distance, optional 9dB 、 13dB 、 24dB , etc., high-gain antennas, communication distance may consult the antenna vendor. Need to note is that data in a table is in open zone environment measured, Indoors or have a barrier of circumstances, the Bluetooth communication range has a larger decrease, the actual situation is complex, needs to be measured according to a live environment. Mutual “can see” visible. As far as possible don't install a product metal in order to prevent signal inside the cabinet is shielded, can use electric cable blue tooth string is proper to go together with machine derivation of the gearing is in the cabinet outside, or use sucker antenna to arrive antenna derivation to outside in the cabinet. when users choose to use RS232、 RS485、RS422 one of three interfaces, you can then use direct wiring, and do not need to switch or jumper settings for trouble, such as internal logic will automatically identify which interface you are using, this is a major characteristic of the product. 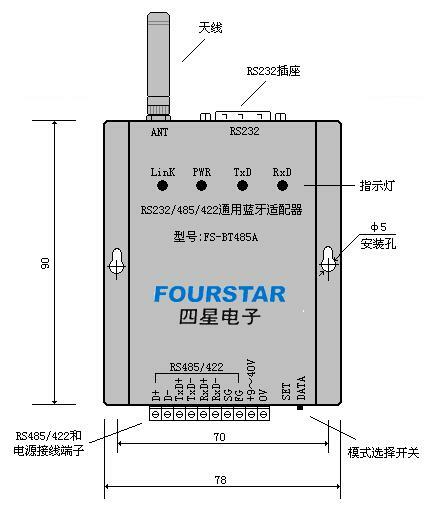 If RS485/422 the cable length exceeded 50m required in the bus only one installation of a 120 terminal resistor, Europe will not repeat them here, users can have access to Fourstar electronic RS485-related product information or refer to EIA-RS485 standard specification. DATA mod: data transfer mode, i.e. the Bluetooth serial port adapter's normal working mode. SET mod: parameters setup mode, set the software on at this time using FS-BT485A conducted parameter settings. FS-BT485A a “ 1 master a from ” pairing use ,before using conducted according to the fact that you want the parameter settings, regarding the data read with the product CD in the Bluetooth serial port setting software BT232Set use statements documentation and setting software from the official website of the four star electronic download. The following an instance to illustrate how to set up and use. Is set on completion, will second FS-BT485A mode selection switch dial to “data ” location, Bluetooth master device will automatically locate, paired and connected equipment from the end of the binding; but the Bluetooth device is always in standby mode, waiting for the master device-side sponsor find, pairing and connections, this process takes about 2～5 seconds, while blue indicator link Flash. Once you master-slave module connection is successful, indicator becomes a link-on, when the master-slave Bluetooth module just like a conductor, built in this State called “built chain ” .The second after the chain Bluetooth module can be carried out between serial ports of bi-directional data transfer transparent serial port, and do not need to modify the original device communication protocols and software. A Bluetooth master device works only with an address to which it is binding and PIN code built from the device with the same, so each chain of production chain pairing a Bluetooth module and other kin chain pairings effect between Bluetooth modules, just like a different cable! 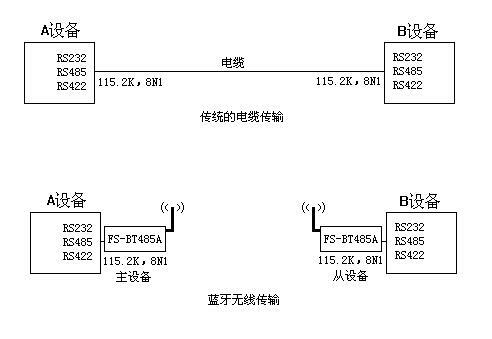 In fact two Bluetooth module can be set to different baud rate and data formats, as long as the guarantee Bluetooth and connect serial baud rate and data of the same format, use Bluetooth serial port adapter of this, the available second FS-BT485A composition baud rate converter or serial port parameters converter. You can apply different baud rate, and serial data format of the device is attached to the same RS485 network. traditional slave RS485 netting multipoint communication, as shown in the following figure, the main station take the initiative to send commands calls each from station, have received from the station master station with a command and related to themselves the address of the internal setting, if they are equal compare the main station from the station and for data transfer, if not equal answer from the station shall withhold. Use FS-BT485A to implement RS485 Bluetooth wireless multipoint networking communication plan, as shown in the following figure, this scenario than Bluetooth itself achievable 1 master bind 7 from the multipoint communication scenarios clearer and easy to use, each pair binds pairing FS-BT485A effects between, that is bind pairing a Bluetooth module after like a between conductors. This scenario does not need to change the original RS485 communications protocols and software, and RS485 site quantity is not restricted, and the same original cable communications. 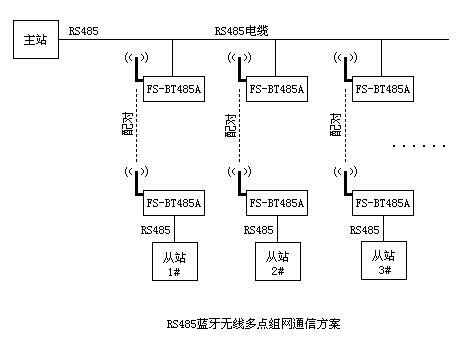 Available second back-to-back connections FS-BT485A to implement Bluetooth radio signal relay and zoom in, and the number of such a Repeater and no restrictions, can increase the distance of Bluetooth wireless communication. The following figure, and A B for Bluetooth wireless communication between distances can be doubled, and each additional multiple of a Repeater, haul doubled.